Right off of Highway 31W and close to Louisville, KY, Knox Hills’ prime location opens up a wealth of nearby shopping, dining, and entertainment venues to our residents, and our location on Fort Knox makes commuting to work a breeze. When you're here, you can enjoy the vibrant community feel of Knox Hills and still take in the culture and excitement of the big city with access to downtown Louisville and all of its famous dining, museums, and attractions. Children of active duty and full-time DoD employees enjoy the opportunity to attend premiere DoDEA schools on post. 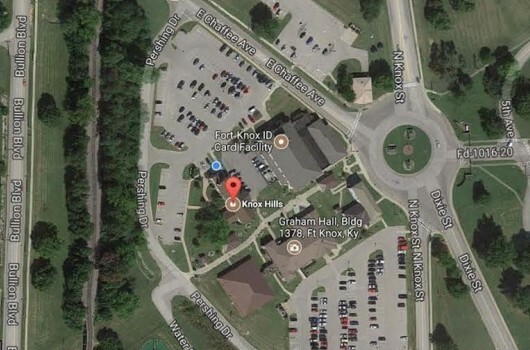 Knox Hills is also near a variety of local-favorite restaurants and fun entertainment. When you're here, you're in the middle of it all. We invite you to come on down and take a private tour of our community. You'll know you're home the moment you arrive. Call us today to schedule a tour. FROM POINTS NORTH OF FORT KNOX: Take I-65 South to Exit 125.Take Exit 125 and merge onto KY-841 W / GENE SNYDER FWY - go 10.1 miles. Take exit 1 for US-31W / US-60 toward FORT KNOX / LOUISVILLE. Keep LEFT at fork, following signs to FORT KNOX. Turn LEFT onto US-31W S / DIXIE HWY. Follow for 17.7 mi to the BULLION BLVD EAST ramp toward FORT KNOX. Merge onto BULLION BLVD. Follow to Chaffee Gate. Once through gate, travel to the second traffic light and make a right onto Chaffee Avenue. Go under the overpass and make immediate right into Army One Stop Parking lot. Follow road to the Knox Hills Leasing Office, located behind Army One Stop. FROM POINTS SOUTH OF FORT KNOX: Take I-65 North to Exit 102 and merge onto KY-313/Joe Prather Hwy. Follow to US 31-W North. Make a right onto US 31-W North and follow for 6.19 miles to the Bullion Boulevard (Chaffee Gate) exit. Exit right and follow to the Chaffee (main) gate. Once through gate, travel to the second traffic light and make a right onto Chaffee Avenue. Go under the overpass and make immediate right into Army One Stop Parking lot. Follow road to the Knox Hills Leasing Office, located behind Army One Stop. We allow up to two pets per family. Dog breed restrictions apply. Contact us for additional information.